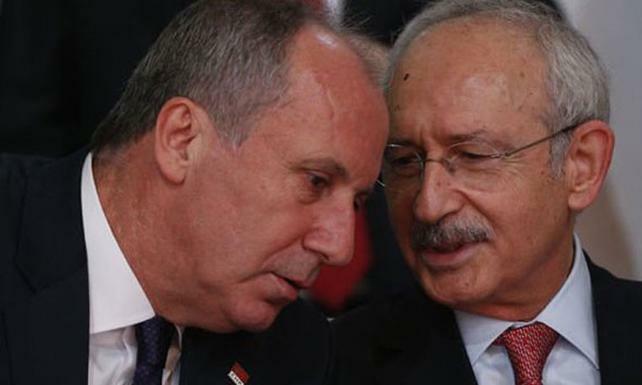 Turkey’s main opposition Republican People’s Party (CHP) presidential candidate Muharrem İnce said that the delayed announcement of his candidacy ahead of the country’ June 24 presidential and parliamentary snap elections was the biggest mistake causing his defeat in last month's polls, secular Cumhuriyet daily reported. Ince, who was put forward as the CHP’s presidential candidate, after Turkey’s presidential and parliamentary elections were pulled forward a year and a half, with only 60 days notice, ran a spirited campaign; however, Turkey’s main opposition suffered a defeat against Turkish President Recep Tayyip Erdoğan and his leading Justice and Development Party (AKP) in last month’s polls. İnce’s candidacy was announced on May 3, 16 days after the notice for snap elections. ‘’If you’ve lost a race you need to think ‘Where did I make a mistake?' and you start preparing again,’’ İnce said, who received 30.6 percent of the votes in the presidential election. The deputy of 16-years noted that he was not surprised by the amount of support he received leading up into the elections and that he continues to receive countless messages to remain in politics and not give up. Noting that he only had 50 days to address voters ahead of the elections, İnce says if his candidacy had been announced earlier he would’ve had a greater chance to reach out to the masses. ‘’Imagine if I had 100 days instead of 50. There are 13 provinces which I couldn’t even go to,’’ he said. İnce stressed that for the first time since 1977, the CHP received more than 30 percent of the votes. ‘’I still received the votes of one in three people. That’s not at all bad,’’ İnce said, adding that he plans to run in the next presidential election. Seçim gecesi üretilen komplo teorileri hakkında konuşan Muharrem İnce, kongrede aday olup olmayacağından, yeni parti iddialarına, seçim kampanyasında yapılan hatalardan seçimden çıkardığı derslere kadar önemli açıklamalarda bulundu.İnce, Kılıçdaroğlu'nun "arkadaşlarımız, İnce’ye gittiği illerde destek olacaklardır” sözüne; "Olmayacaklar mı zaten? Ben CHP’nin bir üyesi değil miyim? Hoş değil bunlar, hem ne gerek var?" ifadeleriyle tepki gösterdi.